I love this time of year as there’s so much going on – Halloween, Bonfire Night, Remembrance Sunday and of course Christmas. We were out shopping yesterday and Toys R Us were playing Christmas music and John Lewis had their decorations up! I felt a little festive but it does seem to start earlier each year. Anyway, the children really enjoyed Halloween this year; they dressed up, insisted on our pumpkin being lit every evening for a week and especially loved seeing the local children knock on our door whilst they were out trick or treating. I’m not sure if we’ll be going to go to a fireworks display yet. They all seem to start so late, despite the fact the clocks have gone back an hour and it’s dark so much earlier. Do I really want to keep the children up past their bedtime to watch fireworks? I think we may be on the look out for some fireworks we can set off in the garden instead. I came across a really fun little craft for edible fireworks so thought we would have a go. 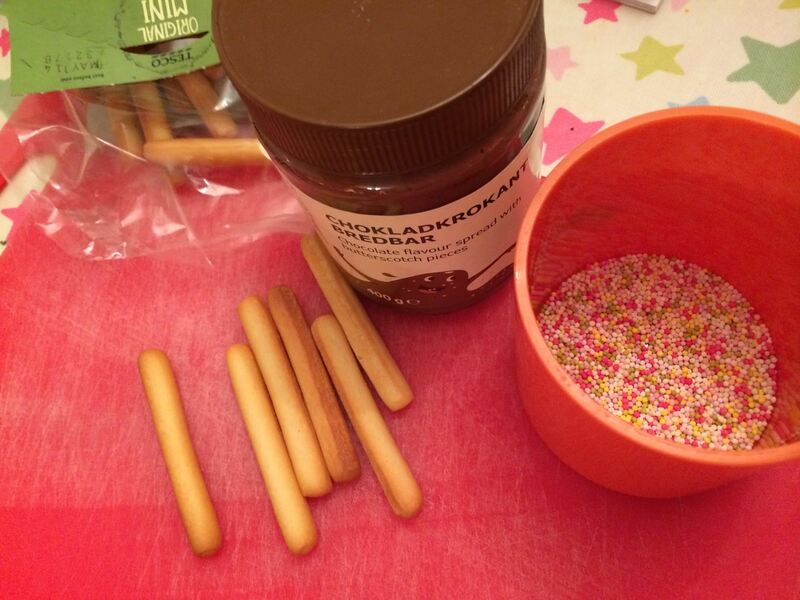 All you need is breadsticks, chocolate spread and hundreds and thousands. It’s so simple I feel silly writing it down but you take a breadstick, dip it into the chocolate spread, then dip into a container of hundreds and thousands! Yep, that’s it. It’s so simple that both the children were able to make them easily. Needless to say my children had lots of fun making and eating them, actually, we all did! oh these remind me of those pots we used to get as kids with sticks in one side and chocolate in the other. what a great and simple idea!